Carpenter (back) isn't included in the Cardinals' lineup for Monday's Grapefruit League game against the Phillies. 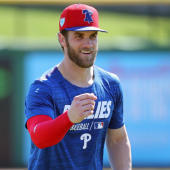 Carpenter will get some more time to recover after he was surprisingly scratched from the lineup ahead of Sunday's game against the Marlins due to back tightness. The issue isn't believed to be a major concern or anything that will impact Carpenter's availability for Opening Day, but he could sit out a few more spring contests for precautionary reasons.